Summary: The day after his drunken revelry, Brandon’s hungover. He warns David and Clare, who’ve just arrived in Palm Springs, to stay away from the devil’s brew. They tell him Kelly didn’t come with them but try to avoid further discussion about her. David assures Brandon that they didn’t see her with Dylan. But he thinks the dinner Kelly had with Alison was more than just a meal between friends. And now Brandon thinks that, too. Donna and Ray are late to Felice’s panel, since they were busy riding horses and fighting. Kelly, who’s in Palm Springs now, is surprised to hear that Brandon’s also there. He’s becoming more and more like a KEG member, making prank phone calls and razzing Kelly for possibly being a lesbian. She tells him they’re just friends. Valerie interrupts, implying that she and Brandon are bunking together, but Kelly doesn’t care. Steve and Rush play tennis again with Robin and her father, and Steve confronts his father for using him for a business deal. Rush and I both roll our eyes. Tom Rose’s girlfriend auditions for Dylan and Charlie’s movie, but she’s horrible. Rose blames the movie plot, since the bank scam would never work. Dylan disagrees, since it’s the scam his father pulled. Rose realizes who Dylan’s dad was, so now he believes the plot. Brandon decides to move in to Valerie’s suite; first he and Steve head off to run some errands. Valerie overhears Ray and Donna fighting over how annoyed he is to be in Palm Springs. He tells her he’s mad because she makes him angry. She tries to walk away, but he pulls her back, making her fall down a flight of stairs. Valerie runs over to help as Ray insists that it was an accident. At a gas station, Steve runs into his “goddess” again and finally learns her name, Elle. She makes a nice double entendre, so Steve loves her even more. Donna winds up in the emergency room, where Ray tells Kelly that she tripped. Her arm is injured, but not badly. Donna decides not to correct Ray’s version of what happened. Steve, Brandon, and Elle go to a bar, and Steve and Elle sing karaoke (“I Got You, Babe”). Brandon has another Jim/Cindy-vision, which confuses him since he’s not drunk this time. They think he’s having second thoughts about sleeping with Valerie (and Cindy thinks he’s right to have those second thoughts). Brandon says that if they really cared, they wouldn’t have abandoned him and moved to Hong Kong. Charlie and Rose stargaze and discuss the movie until one of Rose’s guards tells him Dylan was caught making a phone call. Apparently the recipient of the call is someone Rose doesn’t want him to talk to. Steve gets closer to sealing the deal with Elle, but the moment is over when Steve realizes she stuffed her bra. Then he looks down and realizes Elle has something between her legs that Steve doesn’t want to see. On his way back to the hotel, Brandon gets pulled over (for pausing too long at a stoplight, or something like that). The cop asks if he’s been drinking, and Brandon admits to having had a couple of beers earlier in the day. He has trouble finding the car registration since he’s never driven it before. Something he has no trouble finding: a joint Valerie left in the car. Enjoy your patdown, Brandon. The next day, Rose and his goons take Dylan out to scout locations for the movie. (The finger quotes are implied.) Brandon makes it back to the hotel after a night in jail and flushes Valerie’s stash. He beats himself up for not listening when his parents told him to be responsible and look after Val. He gives her back her keys and says he’ll find another ride back to Beverly Hills. Steve decides to give Robin another shot, since he’s pretty sure she was born a woman. He tells Brandon what happened to Elle, swearing him to secrecy. Donna tells Ray to leave her alone, but says she doesn’t hate him. He basically says he’s annoyed that she wouldn’t let him go back to Beverly Hills, so I guess everything is her fault. Felice is completely unable to read the room and has no idea that there’s a problem. Rose takes Dylan to a tramway so they can take a trip up a mountain. Dylan’s suspicious since Charlie isn’t there. He should have been suspicious a little earlier; it’s too late now, since Rose and his guards force him into a tram. They stop it partway up the mountain, open the door, and hold Dylan outside. Rose reveals that he knows Dylan called Christine, and he’d like to know why Dylan tried to talk to an FBI agent. Rose thinks Dylan suspects him of killing Jack, and insists he didn’t. Dylan quickly says he believes him. Back at Rose’s house, Dylan tells Charlie that he’s done with their deal. Charlie tells him to at least stay for lunch – and Dylan does! What?? Kelly patches things up with David and Clare, since Brandon doesn’t hate her anymore. They’re surprised to see that Felice and Ray seem to be getting along. Valerie tells Donna that she saw the whole “accident,” but Donna asks her to keep quiet. Valerie offers to be there if Donna wants to talk. Donna declines, since she knows there’s something more than friendship and business dealings going on between Ray and Valerie. Then she gives a speech to the frat/sorority convention, saying that the new Alpha girl can’t be pushed around. Dylan and Brandon run into each other at a bus station, then ride back to Beverly Hills together. Brandon shares that his conscience took the form of his parents. Dylan’s impressed that he was able to keep himself from sleeping with Valerie. The guys bond over being in love with and rejected by Kelly. Felice thinks that Ray is a great guy after all; obviously he cares about Donna since he was so worried after her fall. Donna drops hints that things aren’t all rosy, but says she still loves him. 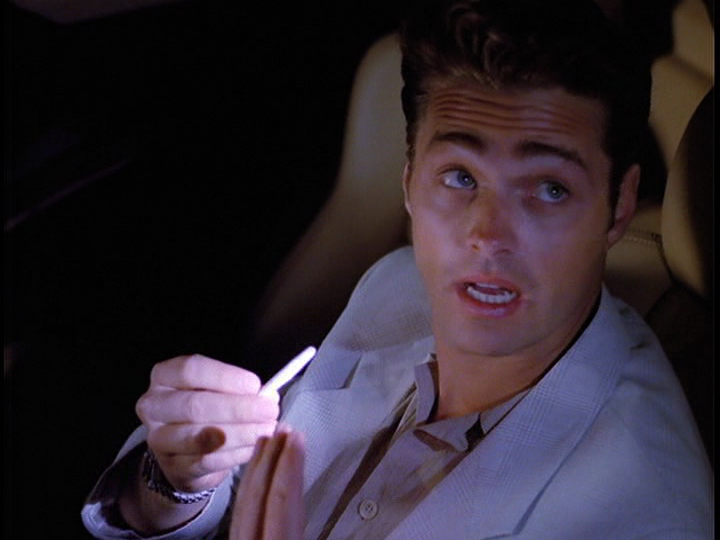 Brandon and Dylan arrive in Beverly Hills, now friends, and Dylan points out that the “for sale” sign on the Walshes’ house is now a “sold” sign. At his own house, Dylan gets a message from Christine, who begs him to stay away from Rose. Dylan ignores her, finding his gun. Brandon’s watching home movies from his childhood when Valerie gets home. (Fun fact: He and Brenda once had a Smurf-themed birthday party.) He assures her that he forgives her, but they’ll need to just be friends and nothing more. Now that the house has sold, they have two weeks to find a new place to live. Then Brandon totally forgets what he said 20 seconds earlier, and he and Val start making out. Thoughts: Whoever cast Elle is a genius. She could pass for a man or a woman. “Hey, kid, to convince you I didn’t kill anyone, I’m going to threaten to kill you.” Makes sense, doesn’t it? I still want to know why Clare’s on this show. “What’s that ‘sold’ sign all about?” Well, Brandon, I think it means your house has been sold. Which was the point of the “for sale” sign. Do you need to write all this down? I’m halfway through the series! And it only took me two years! Sheesh.